English ONLY! And keep posts on-topic! If it doesn't have anything to do with computer diagnostics of BMW motorcycles, don't post it. This list is not a swap-meet, it is not a chat room, it is not a help center for general PC issues or usability, it is not for SPAM, it is not for unauthorized blatant advertising - it is for on-topic (GS-911) discussions only! When posting questions related to a problem you are having with a particular motorcycle, always state the exact make/model/year of the motorcycle you are having a problem with. As of 2012 we insist that you paste or attach an AutoScan of the particular vehicle - this provides us with all the information we require to help you! Also tell us any modifications you have made to it. To be really detailed use the [Copy to Clipboard] function and paste (right-click->paste or File->Edit->Paste or Ctrl-V) into your email client. When asking information on Fault Codes, ALWAYS supply the complete fault code info as shown by GS-911 - this includes the Fault number, complete description, and whether currently present or not!. Incomplete information will often get you no answer, or worse yet, the wrong answer. Use copy/paste! As of 2012 we insist that you paste or attach an AutoScan of the particular vehicle - this provides us with all the information we require to help you! When making a new post, make sure the subject is a concise summary of your issue. The clearer the description the more likely someone will read it and post a sensible reply! When replying to existing threads/issues - make sure your issue is related to this thread. If not, start a new topic/thread! HTML mail is discouraged. If you must send HTML mail, please keep the formatting simple, preferably black on white and a common font such as Courier or Arial, in a reasonable font size. Flames directed at anyone will not be tolerated on this list. It is off-topic for anyone else to complain about off-topic comments. It is off-topic to for any one else to complain about complainers. If you have a suggestion for different or new rules, send them to me directly so that the people on the list can concentrate on diagnosing their motorcycles. Do not send them to the list as only two of the many people on the list decide what the rules are. If a violation of one of the other rules is serious enough, appropriate action will be taken. It will range from private admonishment to public humiliation to banishment from the list. The rules are not negotiable! GS-911 is a unique software and hardware combination that gives the BMW enthusiast the ability to communicate with the control modules in a safe and controlled manner. 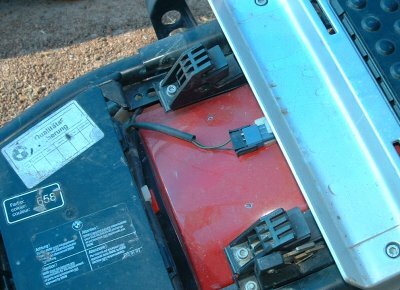 Modern vehicles use electronic control for the engine and all other sub-systems. The electronic control units also offer a wealth of diagnostic functions and information that can help to pin-point problems with the vehicle. BMW motorcycles are no exception to this. The GS-911 toolset allows anybody with a PC or mobile device to tap into this diagnostic capability provided by their BMW motorcycle. Finding the cause of a dead motorcycle while stranded on the side of the road could make the difference between a terrible day and arriving safely at your destination. While technicians use a variety of tools to service the mechanical components of a vehicle, the GS-911 tool takes care of the electronic side. Please refer to the Function-Model-Matrix (Function Chart), as support for other models is continuously being added! Shown here are some of the models covered in either of the full release or the latest Beta. Note: Not all motorcycles have all the systems. Please reference the Function Model Matrix (Function Chart) to see exactly what systems are covered on the individual models. 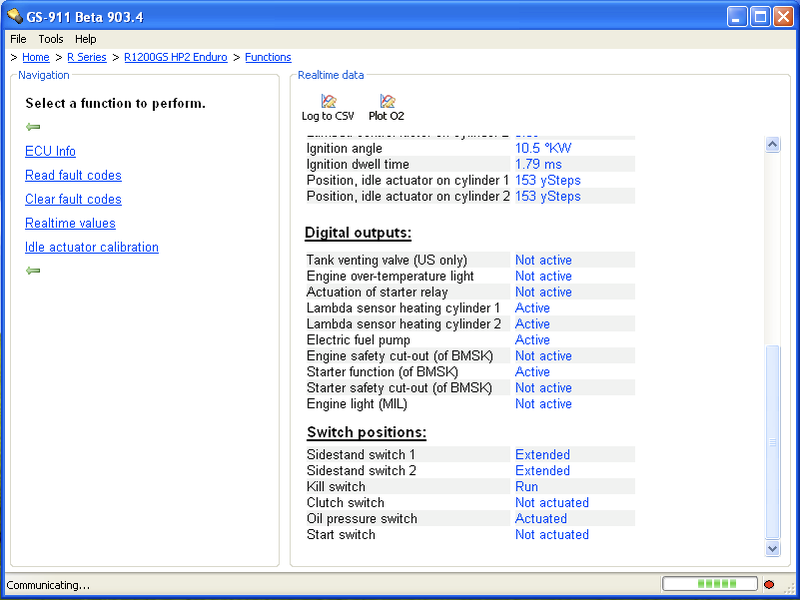 Read Diagnostic Fault Codes This shows the Fault codes and text descriptions of the faults stored on the Electronic Control Unit. 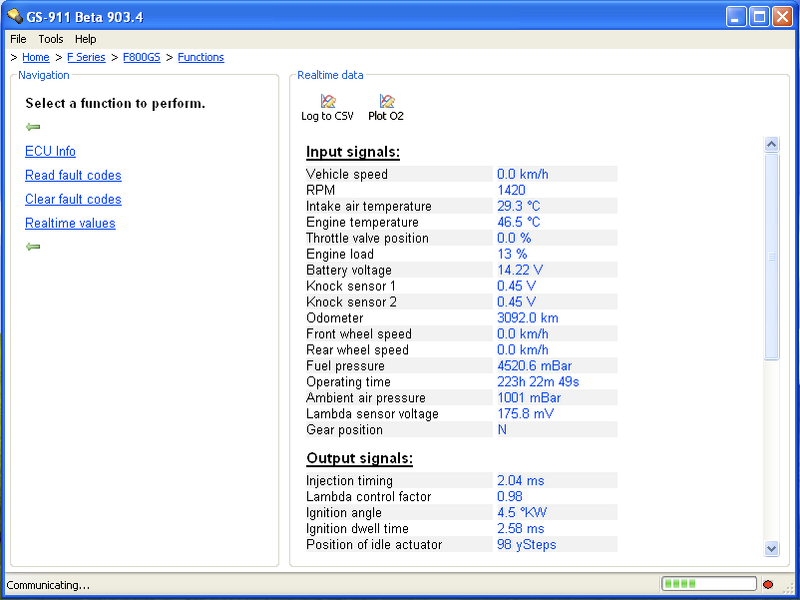 Clears Diagnostic Fault Codes Enables you to erase fault codes once the problem has been fixed. 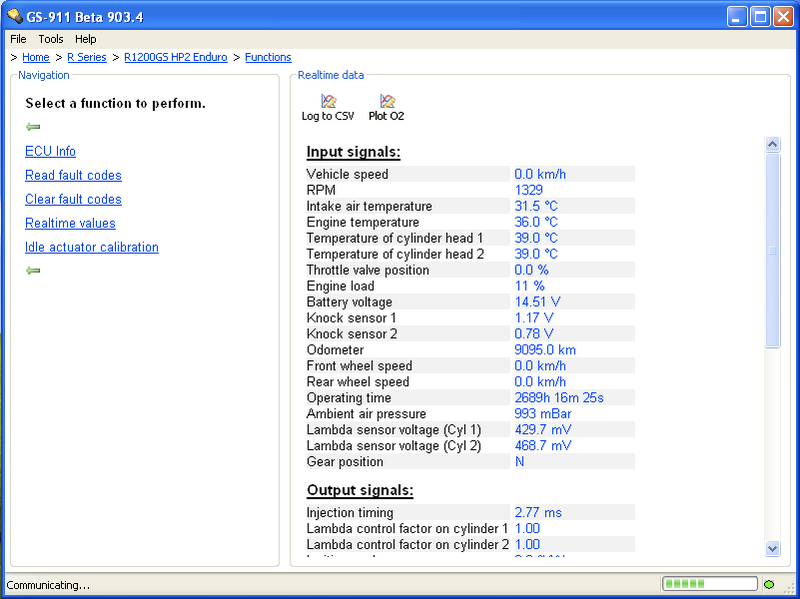 Shows ECU information See hardware and software versions, manufacturing dates, and other manufacturer related data. 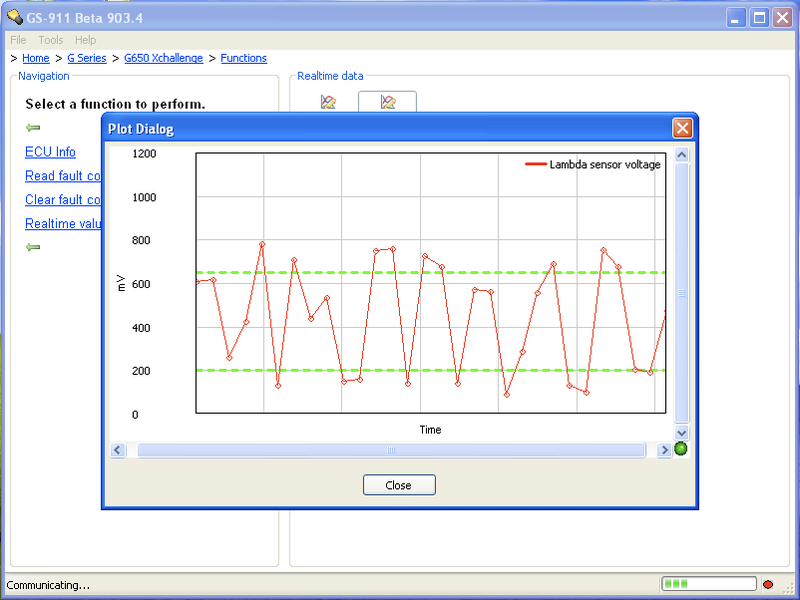 Service Functionality This differs from model to model and controller to controller, and ranges from Service Reminder resets, output tests, adaptation resets, etc. 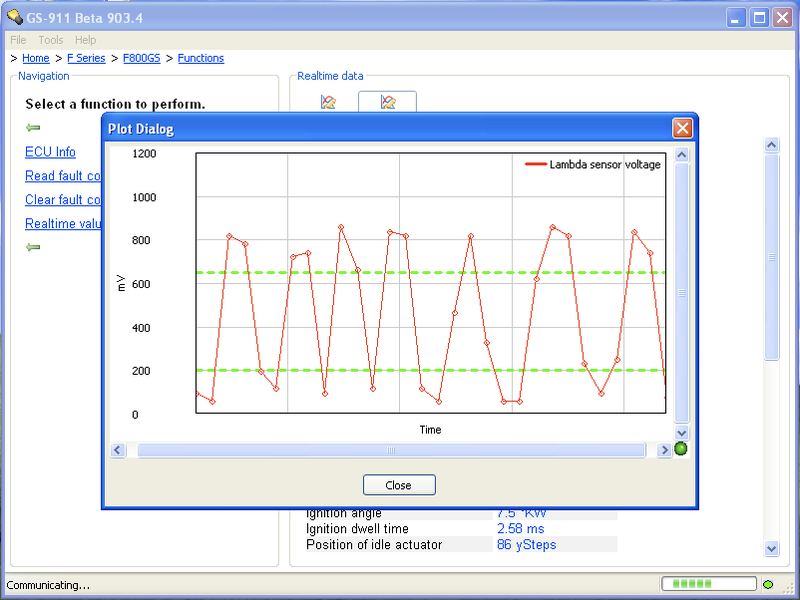 See the Function Chart for more detail. GS-911wifi USB and WiFi This is the second generation GS-911 interface, with USB and an integrated WiFi module. This allows you to connect your PC/Laptop to your BMW motorcycle through USB, or access the diagnostic functions from a web browser on more platforms like Mac, Linux and modern mobile devices. This interface also supports newer bike models that are not compatible with our first generation GS-911usb and GS-911blu devics. GS-911usb USB only This first generation interface allows you to connect your PC/Laptop to your BMW motorcycle through USB. GS-911blu USB and Bluetooth Identical to the GS-911usb above, with an additional integrated buetooth module. This allows you to connect your PC/Laptop to your BMW motorcycle through USB, or use your mobile phone or Blackberry, instead of your PC, to perform emergency functions like reading and clearing Fault Codes. GS-911 3-pin USB only This interface allows you to connect your PC/Laptop to older BMW motorcycle models with the 3-pin diagnostic connector. The WiFi web interface works with only the GS-911wifi interface The GS-911wifi interface allows you to browse its on-board web interface menu from any HTML5 compliant web browser. The web interface provides all emergency diagnostic functions built-in, and also provides service functions from our cloud server when an internet connection is available. The WiFi mobile software works with only the GS-911wifi interface The GS-911wifi mobile app (for iOS and Android) allows you to find your interface on a WiFi network and browse its on-board web interface menu. The web interface provides all emergency diagnostic functions built-in, and also provides service functions from our cloud server when an internet connection is available. Still confused? read more on "Which GS-911 software to use"
As of middle of February 2009, we introduced the Professional version - This applies to the Windows PC software only! read more on "How do the Professional and Enthusiast versions differ?" Want to read some more? Here are some early reviews of GS-911. Displaying the I-level (Integration level) of the CAN-bus models. This tells you what the current software version is of the motorcycle, as well as the software that it was released with when it came from the factory. Set Date of motorcycle - under Special Functions, you can now easily set the Date and Time of the motorcycle (only on motorcycles that support Service Reminders). Selective logging and display of real-time values - Now you can select which real-time values you would like to view and log. This improves the sampling rate on some controllers. added automatic checking for updates - the GS-911 software will check for updates once a week. 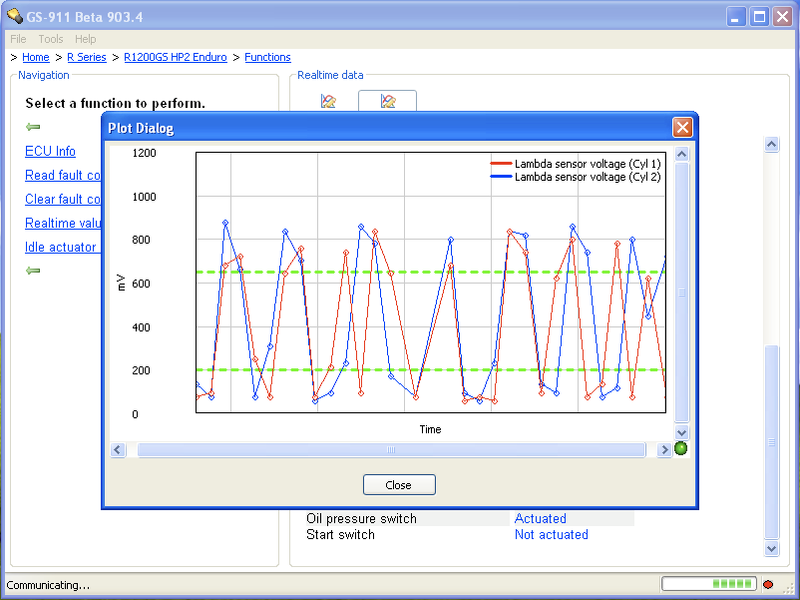 added Service Functionality for MA2.4 - see the MA2.4 Engine Controller detail page. 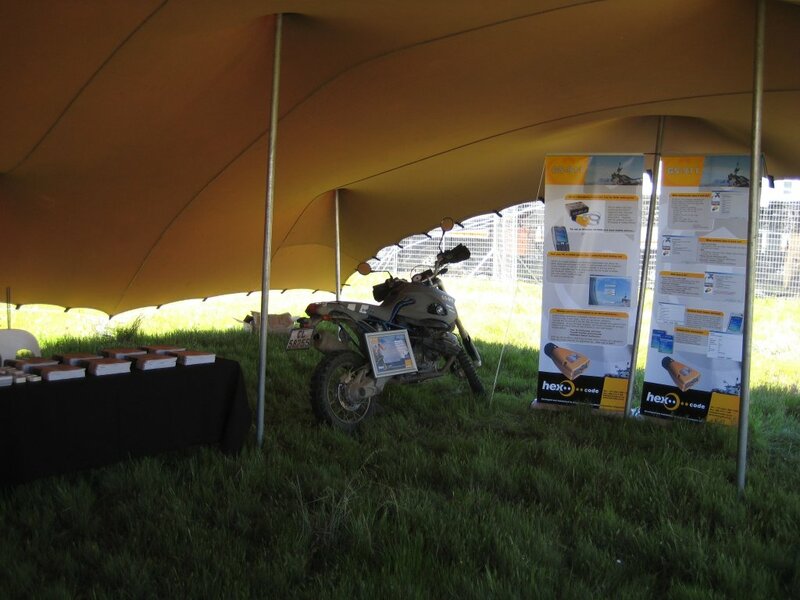 Functionality includes: Output tests, Hall sensor signal tests, Hall sensor setting (positioning) and Throttle Position Sensor (TPS) alignment (including models that have an Idle Actuator (R1200C, R1200CL, K1200GT, K1200RS, K1200LT)). Made a small change to Release 911.1 to ensure forward compatibility. Otherwise identical to Release 911.1. 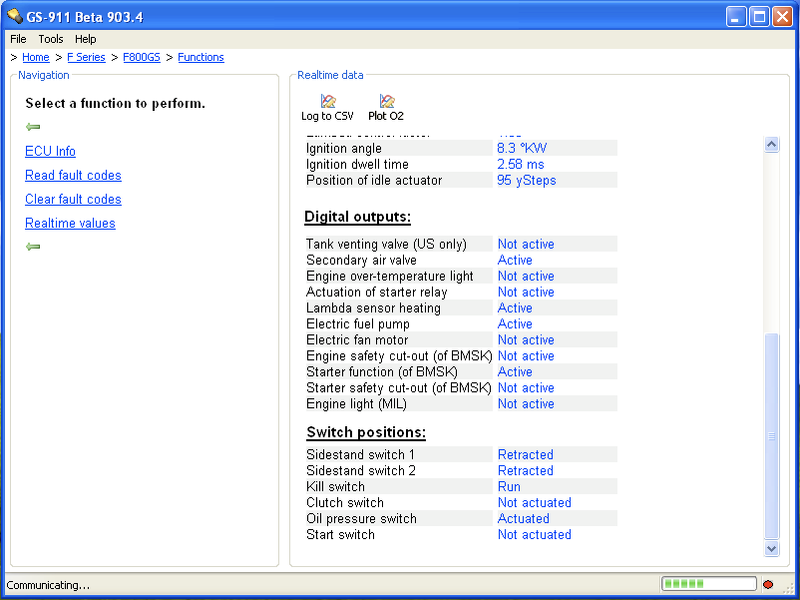 Bug fix on F650 twin-spark ECU (BMS C-II) that had no text descriptions for fault codes. Made the [Cancel] button the default on the fault code erase confirmation. Changed versioning, the versioning now represents the year and month in which it was released. Small usability issue around the "Activation information" in the Setup window. Minor bugfix on usability issue. Known issue fix: installation issue on BlackBerry devices (Duplicate definition for 'm' found in: m) - This is a BlackBerry VM issue - we are working on finding a way around this. JSR-82 compliant mobile phones - please note this does NOT guarantee that GS-911 will work... TEST it with the GS-911Verifier...! If you have one of the mobiles on the list that is not yet verified, please download the Verifier app from our download page and test the device and let us know. If you have a mobile phone that is not on the list, that you have tested, and the test is positive, please let us know so we can add it to the list. This list is by NO means complete and definitely not guaranteed to be 100% correct, but we're ticking the verified ones off - if anyone can add to the list, please let us know. If your mobile device is not on the list, try Googling for it - what works well is typing your model along with jsr-82, for example: "nokia e70 jsr-82"
Also have a look at http://en.wikipedia.org/wiki/Java_APIs_for_Bluetooth and look for "Bluetooth API"
Definition: A Validated Customer is one that is already in possession of his/her GS-911 interface by following the online sign-up process (post September 2008). The online sign-up process is automatically initiated for new customers once they run the GS-911 Downloader. To become a reseller, you must purchase a minimum of 10 units. Once you have qualified for reseller pricing by authorization AND purchasing 10 units minimum, our minimum order is ten (10) or more units at a time. This pricing is for Stocking resellers. We are not interested in a drop-ship arrangement. If we're going to process orders individually, we might as well collect full retail price ourselves. To remain a reseller, it is expected that you have purchased at least 10 units in the past 12 months. Resellers are welcome to sell the product for anything over standard recommended retail price that you feel is reasonable within your market. However, we do NOT allow the reselling of GS-911 for less than the Minimum Retail price. We reserve the right to terminate reseller agreements and discounts to anyone who sells our products for less than the stated minimum retail price. Recommended retail and Volume discount structures are shown below. The discount structure is cumulative. This means two things. Firstly it means that if you have purchased 30 units in the past and purchase a further 30 units, then you now have a cumulative volume of 60 units and are in the 50-99 pricing range. Secondly it also means that the purchase of the two different models (GS-911blu and GS-911usb), are cumulative. This means your volume is made up of the sum of whatever combination of units you've purchased. Small quantities (under 25) should ship pretty much from stock. Larger quantities: 1+ weeks, depending on quantity. Resellers should encourage end-users to register for Tech Support with us using the serial number of the interface. Resellers are expected to provide first tier application support as well as local hardware warranty support to their customers. If a customer reports a defective interface to the reseller or to HEX during the one-year warranty period, the reseller is expected to have enough stock on hand to provide the end-user with a replacement. Resellers should ship defective interfaces to HEX after obtaining a Return Authorization. HEX will ship replacements with the reseller's next regular order. All orders shipped overseas must be paid in advance. All international orders are shipped via express courier (FedEx) from whom we receive substantial discounts. We will quote you an exact shipping price when you place an order. We do not ship international orders via the Post Office -- no exceptions. If you have a way of shipping, or an account with other shipping agents, you are free to use those, however if you do, please note that the responsibility of the packages lies with you, once it leaves our offices (that means insurance against loss or damage). These are the responsibly of the buyer! We have no control or advance knowledge what duties, taxes or fees will be assessed by the customs agency in your country. Duties, taxes and import fees will usually be billed or collected by the shipping company. If you refuse to pay the shipping company, they will invoice us. If we receive invoices for duties, taxes, or import fees because you have refused to pay them, we will refuse all future orders from you and we will remove you from our list of distributors! The product is provided as is. By reselling it, you accept this statement. Although it goes without saying, that we do our very best in order to make sure the product is bug-free, or causes no damage, to either person or vehicle, we obviously cannot guarantee this. The reseller portion will be redeemed as a rebate on the following order. The upgrade rebates are valid for 3 months. Here are Stephan (right) and Francois (left) with one of the support vehicles. Not seeing the point of joining the flurry for autographs and pictures with Ewan and Charlie, I rather spent some time talking with Lachlan (MD of BMW Motorrad SA) and Pieter (Global Sales & Marketing Director of BMW Motorrad). GS-911 and associated material is Copyright © 2005-2010 by HEX Code and Copyright © 2010-2013 by HEX Microsystems (Pty) Ltd. All rights are reserved. De-compilation, disassembly, reverse-engineering, alteration, use as a reference tool for the purpose of developing a product with similar functionality, and re-distribution in any form without the prior written consent of HEX is prohibited. All rights reserved, No part of this publication may be reproduced, stored in a retrieval system, or transmitted in any form or by any means, electronic, mechanical, photocopying, recording, or otherwise, without the prior written permission of HEX Microsystems (Pty) Ltd. Neither HEX Microsystems (Pty) Ltd, its associated companies nor its affiliates shall be liable to the user of this product or third parties for damages, losses, costs, or expenses incurred by user or third parties as a result of: accident, misuse, or abuse of this product or unauthorized modifications, repairs, or alterations to this product, or failure to comply with HEX Microsystem's written instructions. By using GS-911, you acknowledge that this Program is provided "as is" and "with all faults, defects and errors" and that all use of the Program is at your own full risk. 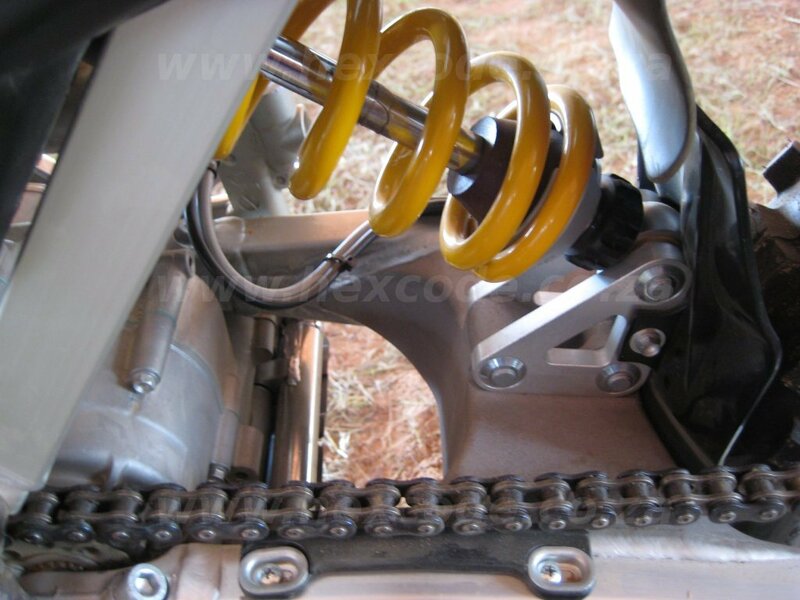 It has been extensively tested, but we cannot guarantee it will work correctly with every system in every motorcycle. We will make our best effort to fix any bugs and to enhance the program, but we specifically disclaim any liability for damage to your computer or your motorcycle or your person, and we do not promise to have any particular enhancements available on any specific date. All GS-911 programs are licensed as per the Click License agreed to when installing the application. This license also grants the user free updates for a period of ONE year from date of purchase, where-after we reserve the right to charge an update fee. In addition, Beta Testers undertake to provide Swift and Accurate feedback to HEX Microsystems regarding the program and its associated hardware. Thank you for your interest in becoming a reseller of GS-911. Below are some questions that make the evaluation of your request a lot easier for us. Please copy-paste these into an email and answer them as best you can, keeping in mind they are very generic, so all additional information you can add would be of great help. Firstly tell us a little about yourself - at the end of the day, we do deal with people not companies, and we would like to get a better understanding of who you are. Are you currently in the Motorcycle business (whether OEM, accessories or other equipment or supplies)? What geographic area do you (plan to) cover? What is the size of the BMW motorcycle market in your geographic region? What volume (number of GS-911 units) would you commit to move annually? What language(s) of GS-911 would you wish to support? Can you give us an idea of the type of promotion you have in mind to market GS-911? In terms of our requirements, discount pricing structure as well as License agreement, these are outlined in our GS-911 Distribution page, for which you will get a login, should you be considered as a reseller for GS-911. You can get a good comparison on the Compare Versions page. Please note the limitation on the Enthusiast version apply to Maintenance functions *only* and not the the emergency functionality like Reading and clearing Fault codes, ECU information and realtime values etc. Please make sure you have studied the Reseller agreement, and if you have any questions, pls feel free to ask. Also have a look at the roadmap for GS-911. A description of the service and maintenance procedures on the ABSN ABS control unit. A description of the service and maintenance procedures on the ABS9M RACE ABS control unit. Configuring the Alarm (DWA) System functionality can be configured using the Alarm Fob (Remote Control). 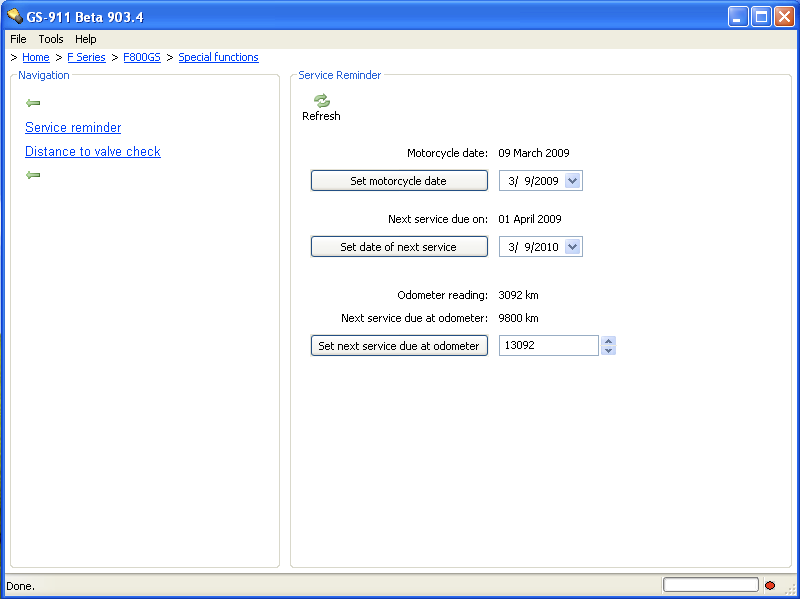 Starting in 2009, we released Service & Maintenance functionality in GS-911. Along with this we introduced the GS-911 Professional version. Oppisite this, stands the GS-911 Enthusiast version. In essence these versions have the same functionality, except for the number of bikes the Service & Maintenance functions will work on. Let's explain this in a little more detail. 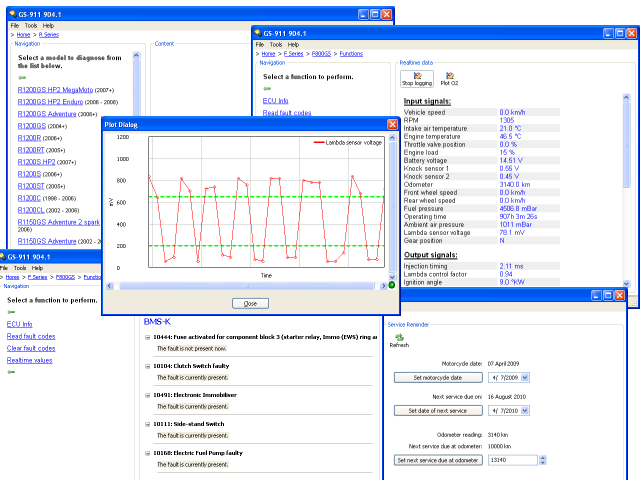 Up to the end of 2008 we supported the reading of ECU information, the reading and clearing of fault codes, (error or trouble codes) as well as the reading and logging of certain real-time data. This functionality is still found (and updated) on both the PC and Mobile platforms, and will remain unlimited - this means you can read and clear the Fault Codes on an unlimited number of motorcycles. The VIN numbers are read directly from the ECU and helps us determine the model type and thus the functionality. Of course an Enthusiast version will prompt a user whether it should add a new VIN to its VIN list, before doing so. Ultimately you, the user, decide whether you would like to allocate a new VIN to one of the empty VIN slots. All existing customers (who purchased GS-911 prior to March 2009) will by default have Enthusiast versions. An Enthusiast interface can be upgraded to a Professional Interface at any time. How do I upgrade to the Professional version? * The Service & Maintenance functionality was an addition to the PC-based software only and was not included in the Bluetooth Mobile version. Service functions were more complex and required more screen real-estate and were therefore a bit impractical to implement on the Mobile devices of the era. The Bluetooth Mobile software therefore remains an "Emergency Tool" only but will be updated so all mobile versions have the same functionality (reading of ECU information, reading and clearing of fault codes, reading of real-time values). For a detailed view of current supported functionality, see the Function Chart. An Enthusiast version of the GS-911wifi, GS-911usb Generation 1 and GS-911blu can be upgraded to a Professional version at any time! This is done by clicking on the "Upgrade" button in the About screen of the GS-911 PC software! click on the [Upgrade to Professional version] button, in the Help->About dialog of the GS-911 application. Once payment has been completed, you will be asked to click on the [Upgrade to Professional version] button in the Help->About dialog again... this will connect to the server, see that you have paid and upgrade your GS-911 interface to a Professional one! We are proud to present the GS-911 903 Beta, released to the public on Monday 16 March '09. Under Help->About you can view how many free slots you you have (relevant to the Enthusiast version - limited to servicing a max of 10 motorcycles - the Professional version obviously is unlimited). For more info on this pls refer to the FAQ: How do the Professional and Enthusiast versions differ? and under the real-time values for all of the Engine controllers, you can log all values to CSV, as well as plot the Lambda sensor voltages. (The R-Series is the only one that has 2 Lambda sensors (all others have 1), and here we plot both sensors simultaneously (with the OEM tool you can only see one at a time)). Feel free to spread the word, and share screenshots!!! The Function Chart always reflects the status of the latest software - please check that your software is up to date. PLEASE CHECK the COMPATIBILITY of YOUR motorcycle MODEL. If your model has limited functionality, regularly check in to see that new functionality has been added! LIN-bus : the new data bus that is used in addition to the CAN-bus on the new generation of motorcycles (known as the K001 chassis). Since the physical layer and diagnostic protocol was changed by BMW, these models are NOT compatible with the original GS-911blu and GS-911usb Generation 1 devices. All of these motorcycles require the GS-911wifi or GS-911usb Generation 2 interfaces. (non-CAN) : earlier motorcycle models that do not have the new CAN-bus system - sometime difficult to tell apart if you have an older 1200, but if it has a choke, it's definitely not a CAN-bus model... These are the K1X chassis models and older models. 2-spark : in 2004 the F650-, R1150-Series and R1100S got two spark plugs per cylinder to eliminate surging some owners experienced and improve emissions. Note: These are the K001 chassis models - ALL of these K001 chassis models require the GS-911wifi or GS-911usb Generation 2 interface! Detailed table of functionality and models covered by GS-911wifi and GS-911usb Generation 2. Detailed table of functionality and models covered by GS-911wifi, GS-911blu and GS-911usb Gen 1 and Gen 2 (very old models may require 3-pin interface). ABS (integral ABS - iABS) yes yes yes yes includes Bleed tests etc. GS-911 version 904 is the latest official release version and supercedes all 903 Beta versions - update now! The updated Function Chart, shows the functionality available per model. Newly updated online User Manual ! ...and lastly, see what we are up to next, on the Roadmap page. 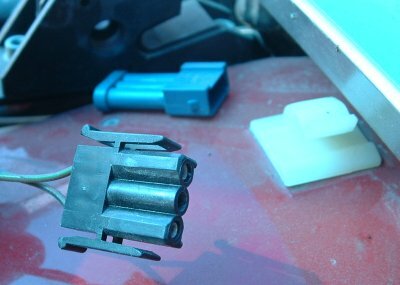 On R1200 Twincam models, after doing a Idle Actuator Calibration, once the engine is started, the idle is very rough. The solution is to do a "Reset All Adaptations Values" (and remember to follow the re-learn procedure afterwards). Once you have experienced this, please do an AutoScan and send us the AutoScan. Then take your motorcycle to BMW and ask them to update the Engine Control Unit's software... Once updated, do another AutoScan and send it to us please. allowing you to select individual real-time units and log them in CSV (semicolon separated) for post processing in Excel etc. For information on installing and upgrading the Windows Mobile software, please have a look at the Video Tutorials in our video section! Registered Customers can download this version from the Beta page. Added support for the BMS-KP2 Engine control unit (most BMS-KP device are upgraded to this during the CD13.x forced software update when you take it to the dealership (fix for "Unknown Controller type"). An Updated version of the Windows Mobile GS-911 software has been released. This version supercedes the previous Beta 905.6, which updates the WinMobile version to cover the models an control units of the 904 PC version and some GUI bugfixes etc.. This version it is a combined install file for both PocketPC (touchscreen) and SmartPhone (non-touchscreen) devices, that run Windows Mobile 5 or 6 or 7. The new setup is SO MUCH EASIER than before - no more setting up the serial ports etc.! 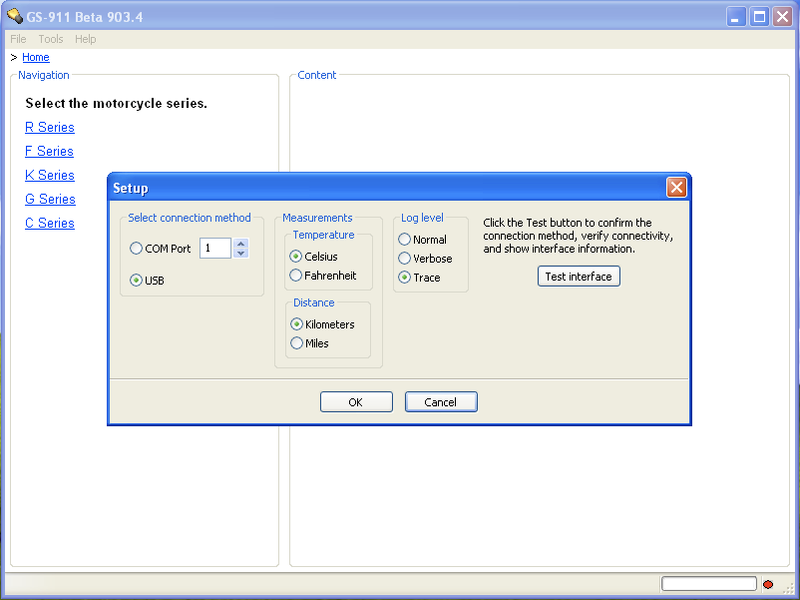 Just pair the phone with the GS-911 device, then select your GS-911 device in the Setup dialog of the GS-911 software! The G450X is an extraordinary motorcycle. 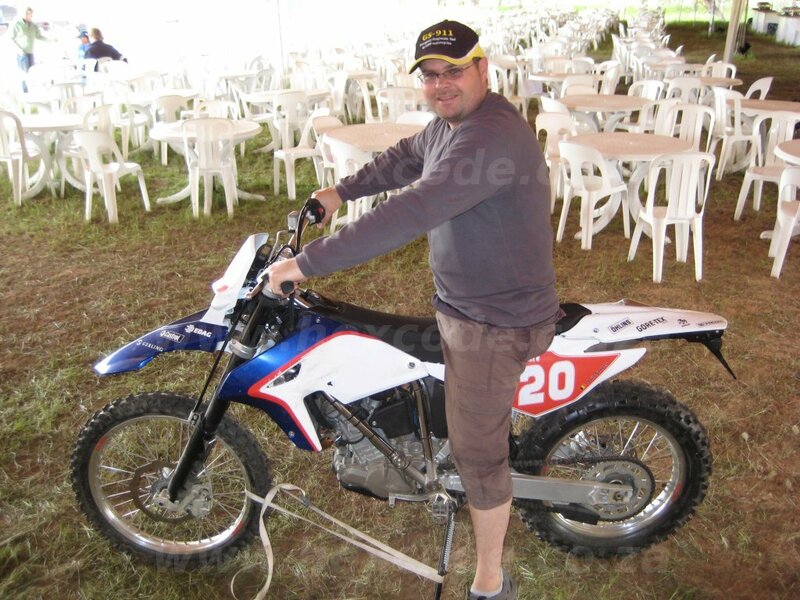 Having moved on from my first F650GS, to an R1150GS, then a HP2, followed by the F800GS, my bikes have always been on the other side of 200kg. Compared to my previous bikes, the first ride on the G450X felt like a mountain bike - with a throttle! The G450X has a power switch/plug, located on the right side. Insert the "Power plug", and the standard 30kW (40.8hp) "Normal mode" becomes 38kW (51.7hp) "Sport mode" (numbers according to the claimed spec). It should be noted that this is engine power, not wheel power, as measured by the dyno - it is generally accepted that the wheel power is expected to be 10-15% less than the engine power. Most owners never read the owner's manual and thus probably don't realize that in Sport mode the G450X operates in "open loop", which means it no longer uses the Oxygen (Lambda) sensor to control the Air-Fuel mixture to comply to the Euro-III emission specs. So what? you might ask. Well, your stock exhaust canister contains a 3 way catalytic converter, which will be permanently damaged/degraded when running the engine in Sport mode! This is why you fit a non-cat slip-on (or full system)... Besides not containing a catalytic converter, the slip-on has less flow restriction, and hence allows more air to pass through the heart of your G450X. BMW suggests the Akrapovic system, however as an experiment we decided to give the LeoVince X3 a try - at around 1/3 of the price. We purchased a LeoVince X3 as well as a Power Commander V for the G450X. We fitted the Power Commander V with little effort, and the plan was to do a run with the stock exhaust canister, followed by replacing the stock canister with the LeoVince X3 and comparing it to the stock canister. Both of these would be done with a "zero map", which means the Power Commander has a zero net effect on the stock fueling. There after our expert tuner would optimize the Power Commander fueling map and once again compare the results to the previous two. The results were dramatic, and I believe the screen captures speak a thousand words! The first graph shows the Power (hp) across the rev range for the three test scenarios. The blue run is with the original canister and stock fueling, the red run is the LeoVince X3 slip-on with stock fueling and the green run is the X3 with modified fueling map. It is quite obvious that addition of the LeoVince X3 has quite a dramatic influence on the power output. However even more dramatic is the power gain once the fueling is fine tuned! Below are the torque graphs for the respective scenarios. You will be pardoned for thinking that we had to ad fuel during the fine tuning of the Power Commander mapping, to get the gains from the red to the green graphs... Quite to my surprise, this was not the case. Below are the air-fuel ratio graphs (remember red is the X3 with stock fueling and the green is the X3 with modified fueling). Naturally we could not measure the Air-Fuel ratio of the Stock canister, as it contains the 3 way catalytic converter - One never measures the A/F ration after the cat as the would not be a true representation of the A/F ratio. You will notice that the X3 with stock fueling runs considerably richer (a lower value signifies a richer air-fuel ratio). According to our expert tuner this is not uncommon! And to give you an idea of just how much the stock unit was over fueling, I've included a screenshot of a portion of the fueling map that shows the rev range 3750 to 7500 rpm. The columns are %TPS (Throttle Position Sensor). For those of you that don't know the details of a Power Commander V, the values in the cells are % of stock, thus a value of -12 signifies a value of 12% less than stock. You can see that the modified map, (resulting in an average air-fuel ratio of around 13.2) is leaner by 10 to 20% compared to the stock fueling... imagine what that means in terms fuel consumption and additional distance in your next race! The first thing we were asked was whether the G450X could switch between Normal mode and Sport mode in real time? Contrary to what a lot of people say, the answer is a definitive NO! We initially proved this on the dyno, doing a run, then switching power plug modes and doing another run and comparing the results. We did this both ways and in each case proved that the ECU reads the state of the Power Switch at Ignition ON, and stays in that mode, independent of the change in position of the switch, until the next Ignition ON cycle. Later we also confirmed this with GS-911 (Diagnostic Tool for BMW motorcycles). From the KMS-K16 ECU we can read the Power mode of the ECU (Normal or Sport) and it clearly only changes after the next Ignition ON cycle. Interestingly enough the ECU also has a Power Mode Memory feature, which is a flag that is set in the ECU once the ECU is switched into Sport mode the first time (i.e. the ECU keeps track of whether its ever been in Sport mode or not). 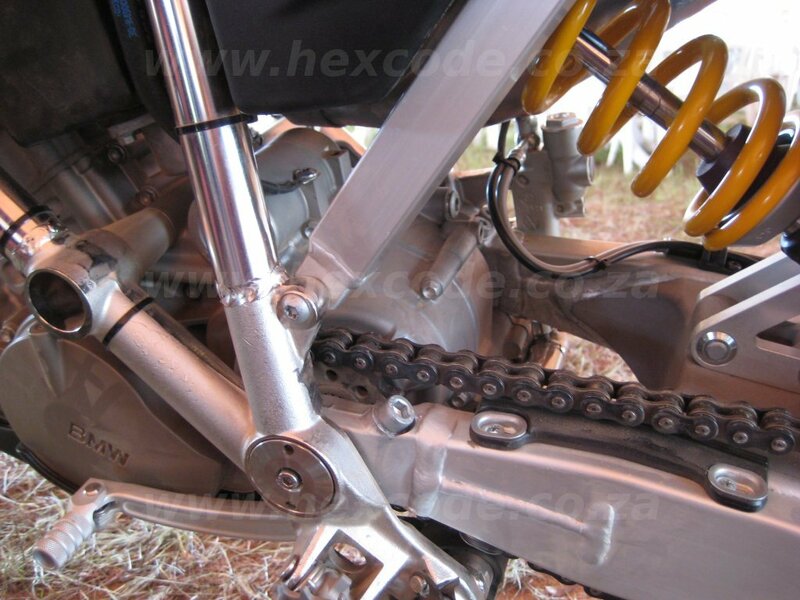 The only modification we had on our bike was the LeoVince X3 slip-on. The air filter was stock (we ran a couple of runs without the air filter with no significant change in the power and torque curves, negating the necessity to change or modify the air filter). NOTE: in standard mode the bike already runs very lean with it's stock map... hence you should NOT run the PowerCommander map with the bike in Standard mode - make sure it is in SPORT mode! More information on the G450X is available on our G450X Techinfo page, including full Wiring Diagram. I-level (also known as "Actual I-level"). These I-levels represent the software/data release versions programmed into the vehicle and are shown in the ECU information screen on the GT1 as of CD 22.0. The I-levels are found in the BMS-K, Kombi and ZFE controllers, and are NOT always set in a Control unit. In future we will release an update of GS-911 that will show you the overall summary of the motorcycle, but until then you should read the I-levels in all control units. If no I-level is set, we will display "Not Set". If "unknown I-level" is shown for your model, make sure you have the latest and most up to date version of the GS-911 PC software (suggested the latest up to date Beta version). Naturally if it is a very recent I-level release, then we might not have the data yet. NOTE: If your motorcycle does not have the absolute latest I-level, it does NOT necessarily mean that it's Firmware is out of date or that it needs a Firmware update. The ECU's have a limited number of times that the Firmware can be updated, and thus a Firmware update is only released by BMW, for specific models... you might have a K024-08-02-500 I-level (released February 2008), but that does not mean that it is not the most up to date version of the Firmware available for your model! 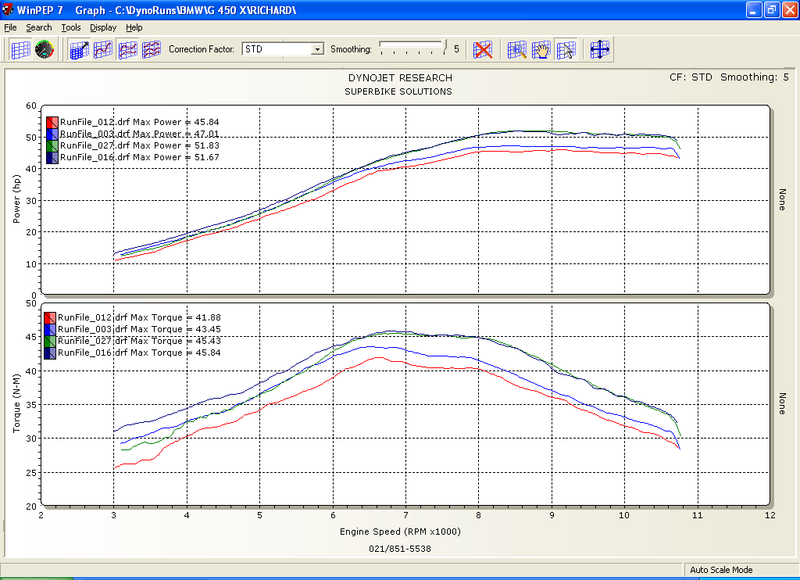 This is a follow-up article on the August 2009 article where we looked at the effect of optimizing the fueling on a G450X, fitted with a LeoVince X3 slip-on. This time we take a G450X with a full Ackrapovic system (this means header pipe and canister), add a PowerCommander V, and give it to our expert tuner to optimize the fueling of the bike. Finally we compare these results to those of the bike with the LeoVince X3 slip-on of our earlier test. 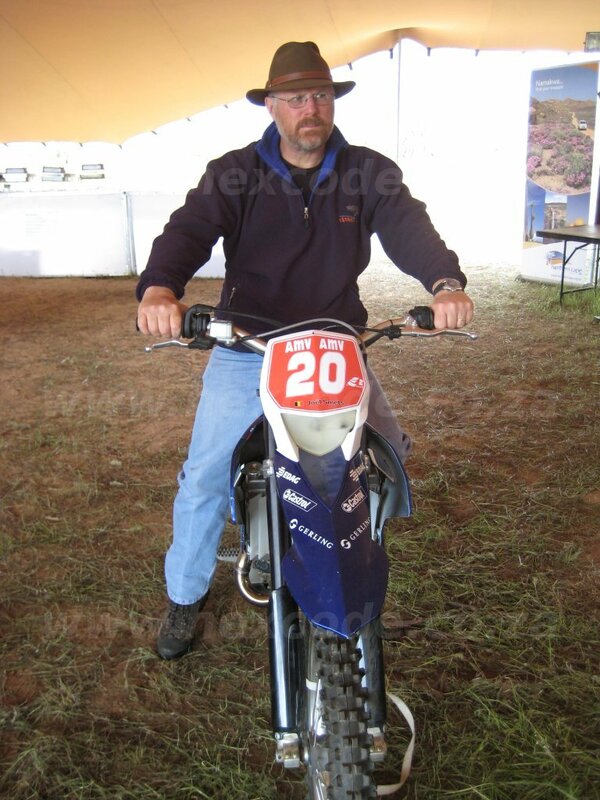 For our test we got to use the EnduroWorld long term G450X, sponsored by Donford BMW. Besides the full Akrapovic system, the bike is stock, including the air filter. Of course the bike is set to "Sport mode". It should be noted that with the optimized fueling map, the bike should ONLY be used in "Sport mode", as this firstly runs the bike in open-loop (the Lambda sensor is disabled), but more importantly, the bike already runs very lean in "Normal mode", and if the ECU is switched to Normal mode, while the PowerCommander is still trying to lean out the mixture even more, it WILL result in engine damage... it is only a matter of time! 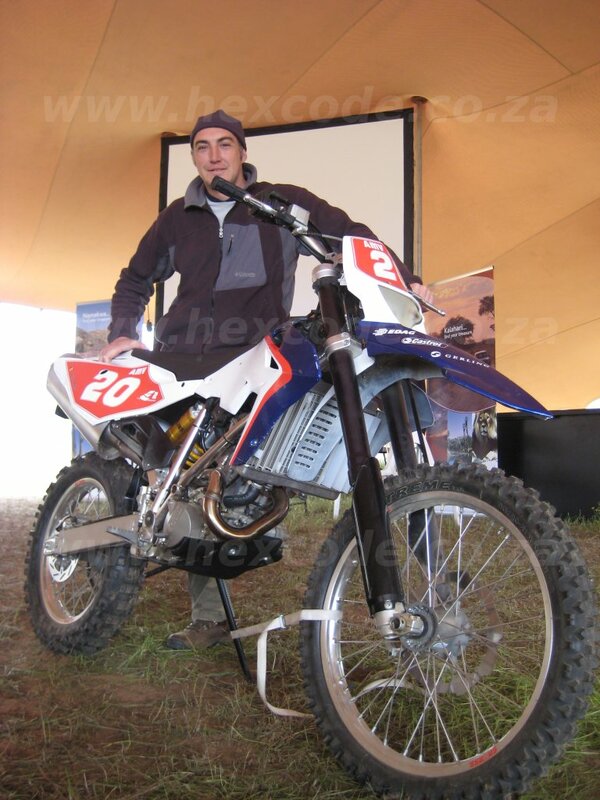 As was the case with the HEX G450X (August 2009 article), we can see that the EnduroWorld (EW) bike is running rather rich in Sport mode. Below the AFR is shown for the bike in Sport mode, with stock fueling (blue graph) and once the PCV is tuned to deliver an AFR of around 13.1 (red graph). We can also see that the fueling optimization led to an increase in Power (4.6hp) and Torque (2.4Nm). Looking at the values of the map within the PowerCommander software, we can see a reduction in fuel of up to 30% in some cells... Of course you should not kid yourself and expect that much of an overall improvement in fuel consumption, but my gut feel is that you would be looking at a good 10% improvement withing the usable range ! Similarly we can compare the two bikes without the PowerCommander (both in Sport mode of course!). Below are the Power and Torque graphs of both the EnduroWorld and HEX G450X bikes, before and after the optimized PCV mapping. But, once all is said and done, after the PowerCommander is added and the mapping is done, they are very much alike! And eventually it comes down to comparing the price of the Full Akro to that of the LeoVince Slip-on... and deciding whether the differences are important to you! The PCV map that was used in this experiment can be downloaded from our G450X tech page. As always, any feedback and comments are welcome... in the meantime... enjoy the ride! In the age where iPods and iPhone clones are as common as counterfeit auto parts, it comes as no surprise that there are counterfeit versions of GS-911! These products are offered for sale (mostly online) at a reduced cost. These products are most definitely counterfeit goods! is of extremely poor quality. When powered up, the LED remains BLUE. No barcoded label on the box or GS-911 with the Serial number and production date. Shows incorrect User details when downloading software. Does not require you to Register your GS-911 unit - All NEW devices do! End users and Service providers are asked to be aware of sellers that are using original GS-911 web download pictures to sell counterfeit GS-911 devices, as these pictures do not necessarily represent the actual item that you will receive! Naturally the more differences one points out, the more effort the cloners/counterfeiters put into making their counterfeit devices look even more alike! HEX has pretty strict rules and regulations, governing their resellers, and promotional discounts have to be cleared, before they may be applied... Hence, the golden rule applies : If is seems to good to be true... it probably is! HEX does NOT manufacture in the Far East or China, and if you see anyone selling a device from there, for a price distinctly lower than the official retail price, then you can be quite sure that you're seeing a counterfeit product. We are taking this matter very seriously and any information may help us in dealing with the matter. We ask our Resellers and loyal customers who come across these fake devices, to find out where the customer purchased the item as well as the serial number, and escalate this information to our Help Desk without hesitation. The unauthorized possession, distribution, offer to sell and sale of these counterfeit GS-911 devices is an unlawful act which constitutes a crime and will be prosecuted accordingly. Naturally no support or warranty will be available to any users with such counterfeit GS-911 devices! Nor can we guarantee the correct functioning of hardware that was not designed/manufactured by HEX, as our software is intended to be used solely with our original HEX hardware. It goes without saying that customers are taking an immense risk using hacked/cracked hardware and/or software in general, as counterfeiter/cloners of such counterfeit software are notorious for embedding malicious code or some form of virus, trojan or spyware into such software! You can report the offending sites/seller to the payment, shipping and marketing channels they are using! The more complaints that these channels receive from an offending site, the easier they will take appropriate action!!! PAYPAL: Put Fraud Alert in the subject line, reference the offending page and state that they are selling counterfeit items and thus they are making themselves complicit in collection of illegal income. Skype: Request to add the offending party to your Skype contacts. Once added, right click their name in contact list, block and report abuse as above. Twitter, YouTube and Facebook: currently these have to be contacted by us (HEXCODE) directly... but if you know of pages and accounts on these media, pls let us know! DHL.co.uk - Go to http://www.dhl.co.uk/en/contact_centre/contact_express/contact_express_complaint.html and register complaint about the website advertising the use of DHL services to ship counterfeit items internationally. Please register and become a member of the online community. We are in the process of forming a knowledge base. Make sure you read and adhere to our List Rules! The HEXCODE GS-911 forum is located here: http://forum.hexcode.co.za/forum. If you do not want to receive all the discussion messages, but would still like to receive notifications of all GS-911 software and product releases, then subscribe to the announcement list below. What type of motorcycle you are working on - include year, model, and variation. What feature in the software are you using? And describe the problem you are having as thoroughly as possible. Tell us what version of the GS-911 software you are using, as well as whether it is on a Windows PC / laptop, or specific mobile device (be sure to specify the full make and model of mobile device). For more information on the service functionality please click on the control unit. The GS-911wifi provides an on-board web interface that you can access using a web browser on your mobile device or desktop when it is connected to the GS-911wifi device over a WiFi network link. 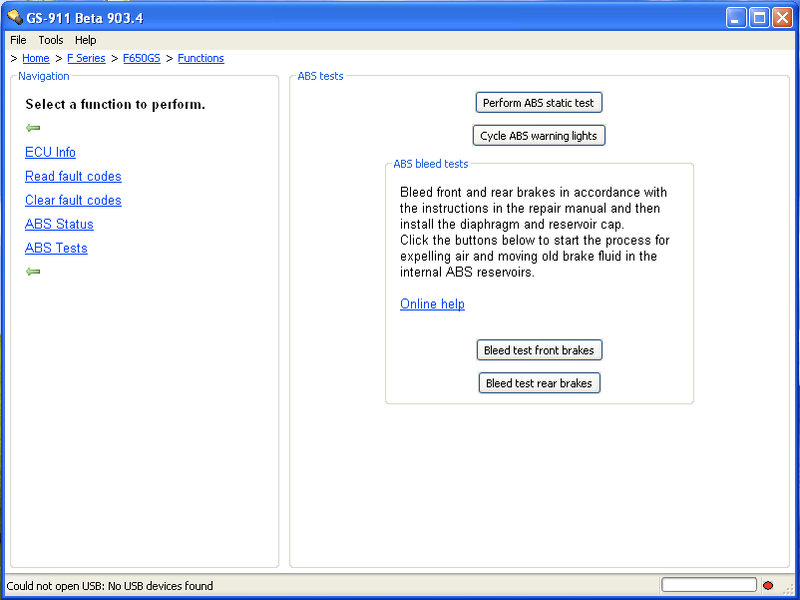 This allows you to diagnose your bike from your web browser with all the same functions that are available in the GS-911 Windows PC software. For this to work you need a HTML5 compliant web browser and a working WiFi network. Most modern smartphone browsers are HTML5 compliant, but please verify this with the manufacturer. For service functionality you need an internet connection, while emergency functionality (ECU Info, Read/Clear Fault Codes, Realtime values) works without internet access. D2D connection: This is a direct WiFi link between your browser device and the GS-911wifi device. In this mode, the GS-911wifi provides its own WiFi access point and consequently no internet is available. Your browser device must connect to that WiFi network provided by the GS-911. The WiFi network name (SSID) is based on the serial number of the GS-911 device, for example GS911_1234. Infrastructure connection: For this option, both the GS-911wifi device and the browser device connect to the same WiFi network using a WiFi router connected to the internet. The hotspot function of modern mobile devices can also be used for this option. Infrastructure connection: The GS-911wifi address depends on its network configuration. The GS-911wifi Utility for Mac or Windows can report the IP address of your device. It can also open the GS-911 web interface in your browser if it finds the device on the network. The GS-911wifi mobile app for iOS and Android can find your device without knowing its address. On other platforms (eg. Linux), you can browse to the Multicast DNS address, eg. http://gs911_1234.local/ (On Windows, you can also browse to the NetBIOS address, eg. http://gs911_1234/). The last 4 digits of this address is the last four digits of the device serial number. Read more about the GS-911wifi network configuration. Definition of "GS-911 Mobile" or "GS-911 Bluetooth"
Diagnosing your bike over a Bluetooth link using a compatible smartphone app with the GS-911Bluetooth interface. Android is supported but iOS (ie. iPhone or iPad) devices are not. 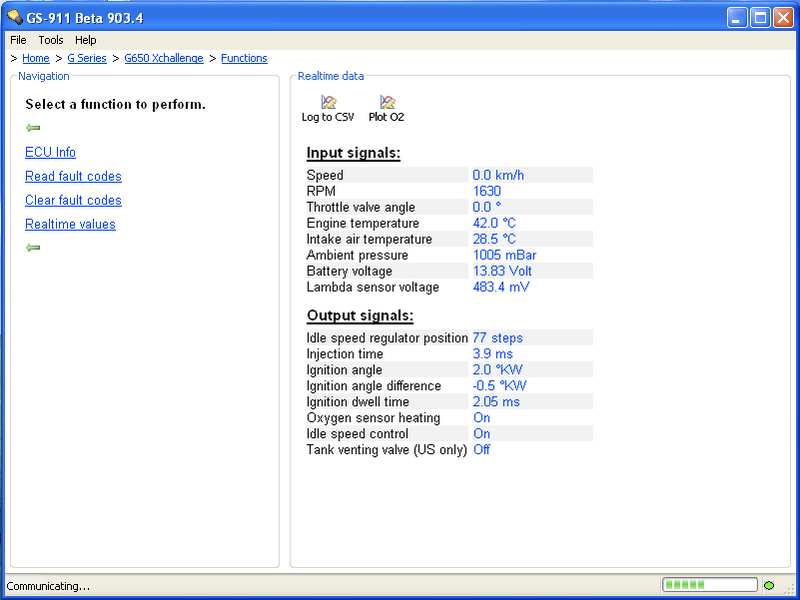 GS-911 Diagnostic functionality for the TR650 Strada. all controllers use to be dumped in home->Products->GS-911->controllerXXX. cleaning this up into this folder.